Champagne. Also the title of one of Hitchcock's late silent films, a comedy about a headstrong “champagne heiress” who has to get a job (but not for too long). 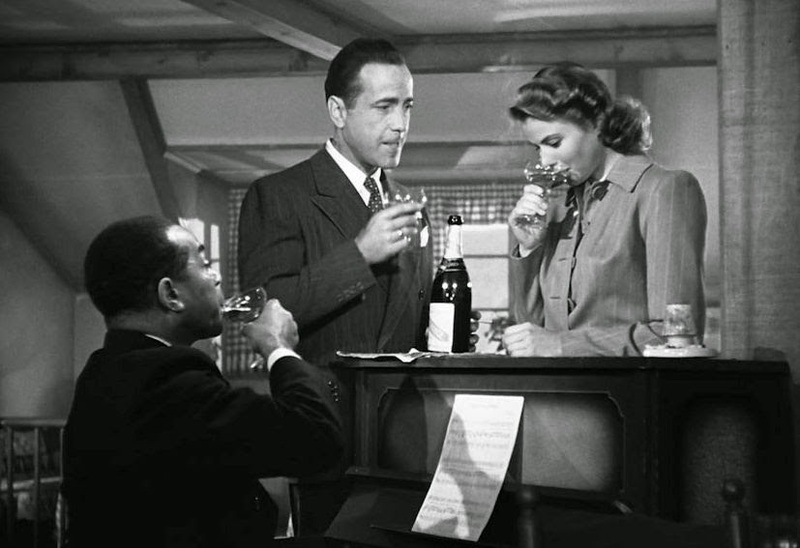 And in Casablanca, Rick and Ilsa fall in love in Paris, sharing more than a few glasses of the fizzy stuff during their brief romance. At La Belle Aurore, when the Nazi army is about to occupy the city, Sam plays As Time Goes By and Rick pours a glass of champagne for Ilsa: "Henri wants us to finish this bottle, and then three more. He says he'll water his garden with champagne before he'll let the Germans drink it." 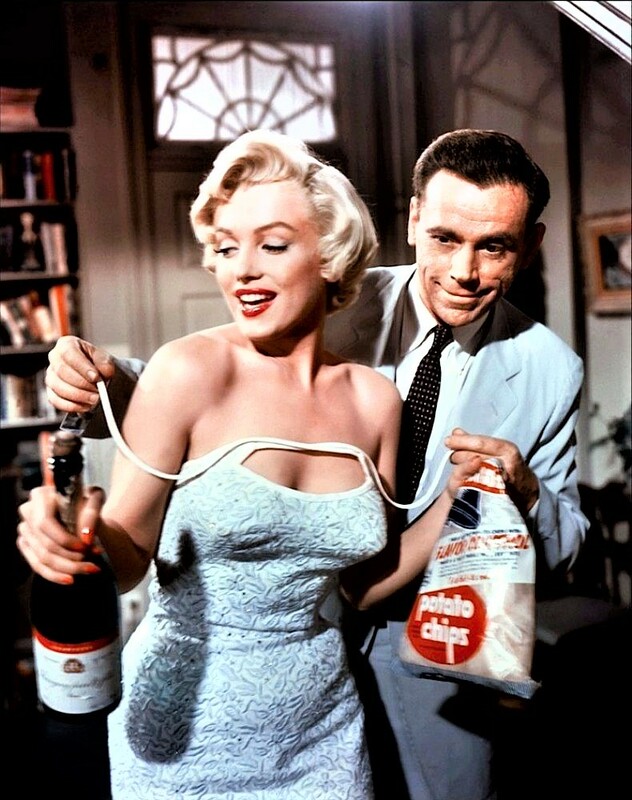 13 years later, in Manhattan, “The Girl” who sets her neighbor’s imagination - and his heart rate - racing in Billy Wilder’s The Seven Year Itch had a yen for champagne…with potato chips. And then there's James Bond. As well known as 007 is for drinking his vodka Martinis “shaken, not stirred,” he has been equally fond of champagne and it's been noted that at least 22 Bond films show the man drinking champagne some 35 times, usually Bollinger but not infrequently, Dom Perignon. A Benedictine monk, Dom Pierre Perignon was a cellar master at an abbey near Epernay during the late 17th and early 18th centuries. He didn’t invent champagne, but he did much to upgrade its production. In the beginning, the bubbles in the wine were considered a flaw in the fermenting process. When he couldn’t eliminate the fizz, Dom Perignon found a way to regulate it. He also implemented the use of thicker glass bottles that better tolerated pressure (champagne bottles were notoriously prone to burst then and when one exploded, a chain reaction often followed) and rope snares to keep the corks in. Owing to the volatility of champagne bottles in the early days of its popularity, prices rose. By the time improved production practices solved the pressure problem, champagne had developed its reputation as a luxury - and remained luxuriously priced. To return to Strawberries Romanoff, the inspiration (which may or may not ever have been featured in a film) for this ramble, the dish's history has been disputed, but the most widely circulated story places its beginnings in the vicinity of Hollywood in a restaurant belonging to "a rogue of uncertain origin." "Prince" Michael Romanoff (born Hershel Geguzin in 1890 in Lithuania) was a colorful celebrity-restaurateur during Hollywood's glory years. He opened Romanoffs on Rodeo Drive in Beverly Hills in 1939, bankrolled in part by the likes of Bogart, Cagney, Chaplin, Zanuck, Robert Benchley and Joe Schenck. 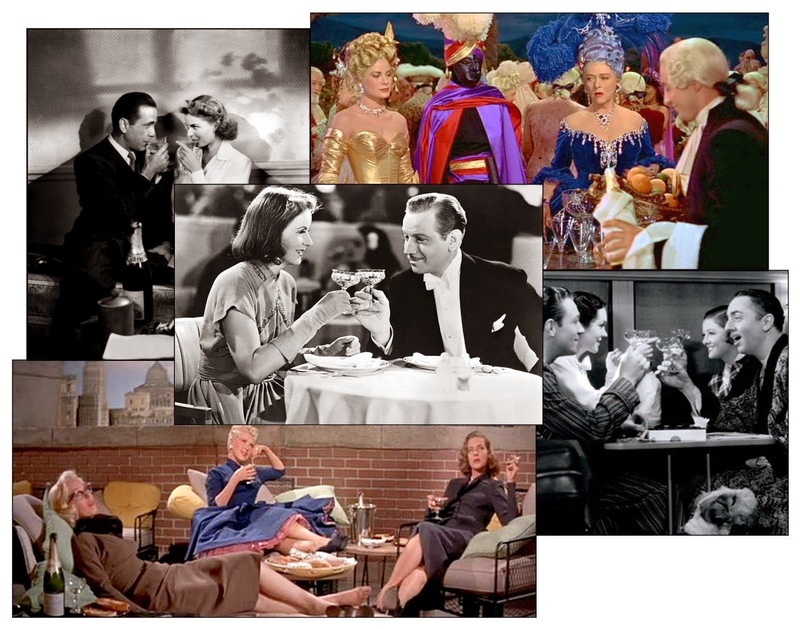 Romanoffs became one of the great supper clubs to the stars of the era, along with The Brown Derby, Chasen's and Perino's. 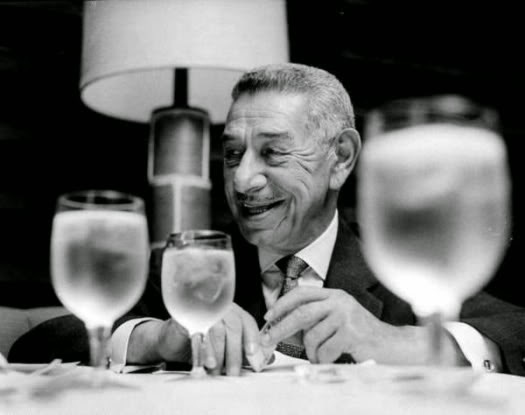 As much as the restaurant was a haunt for the legends of the silver screen, it was also a spot where deals were hammered out between talent agents and studio moguls of the time. 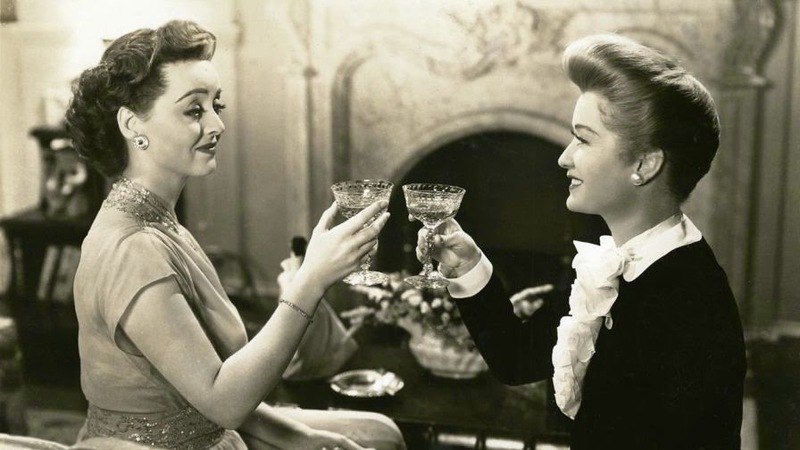 It is even said that dueling gossip columnists Hedda Hopper and Louella Parsons finally made their peace at Romanoffs. 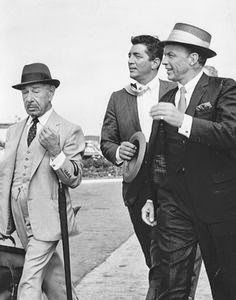 Mike Romanoff had been a member of Bogart's original "Rat Pack" and remained a part of the group when it transformed following Bogie's death and Frank Sinatra took up the mantle as leader of "The Clan." By 1962, when Romanoffs closed, Prince Mike was rarely at the restaurant, often traveling with Sinatra and company on film shoots or to Las Vegas. 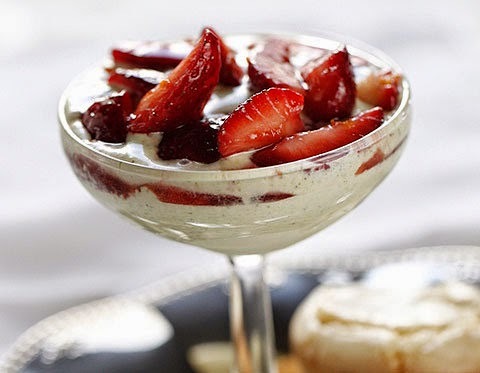 As for the origins of the recipe for Strawberries Romanoff, some say that French culinary genius Escoffier actually created the dessert (as "Strawberries Americaine Style") while he was chef at London's Carlton Hotel at the turn of the century. The implication is that Mike Romanoff simply appropriated the recipe and changed its name. Others suggest the dish may have originated with another French master chef, Marie Antoine Careme, a proponent of grande cuisine who lived 100 years before Escoffier and was, at different times, chef to Napoleon, England's Prince Regent (later George IV), one of the Rothschilds and Tsar Alexander I of Russia, a Romanoff. Wash, stem and slice 2 pints of fresh strawberries and combine them with 1/4 cup sugar and 1/4 cup Grand Marnier. Chill for an hour or so. Put a pint of vanilla ice cream in the refrigerator to soften and whip one cup of heavy cream until soft peaks form. Fold the softened ice cream into the whipped cream and gently add the berry mixture. Serve instantly. And don't forget the champagne. Eve, A wonderful and original post. The Strawberries Romanoff sounds delicious!. Thanks, John, glad you enjoyed this somewhat "free association" approach to classic film blogging. Strawberries Romanoff is easy to make - which may be the only way you'll have a chance to sample it, I don't think it's served in many restaurants these days. Your mind wandered to a lovely place. 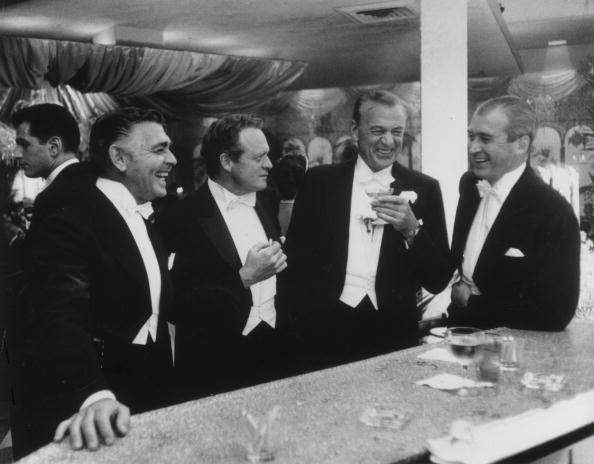 I must try Strawberries Romanoff, and I must watch some movies with those four gentlemen in the picture from 1957. CW, I agree, you "must" do all of those things! Great piece Lady Eve, and nice bit of memory dredging. I remember the legend of Romanoff's from LA, I think my parents went there (he wasn't a real Romanoff though), and of course champagne was never a stranger in their household in the 50s. I'll have to try your recipe. Now's the time for strawberries. Thank you, Christian. Romanoffs was definitely legendary, I knew of it even in the "backwoods" of northern San Diego County. It is the perfect time of year to whip up some strawberries a la Romanoff, let me know what you think if you do make the recipe. Now you are talking my language! Champagne goes with EVERYTHING. An intoxicating post, my dear! Perhaps we'll have a chance to share a toast with a bit of the bubbly in Hollywood next April, my friend. Hope so. Great post, Eve! I love to cook as well, so I may have to try your recipe. (Or, whoever's recipe it is.) 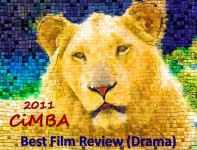 That was an inventive way to post your memories, laced with movies. Thanks, Allen, just doing something a little different for a change. There are many variations on Strawberries Romanoff (including Raspberries Romanoff), this is the way I've always made it. Hope you make some, I can't imagine you won't like it. A very entertaining post, Eve! I thought briefly that your mind might wander off into strawberry movies. That beings WILD STRAWBERRIES to mind. When I was a 14, I saw a drive-in ad for an Ingmar movie and thought the newspaper had spelled Ingrid's name wrong. See, that brings the conversation back to Ingrid and your bubbly post. All the other comments are correct, this is a very charming post! 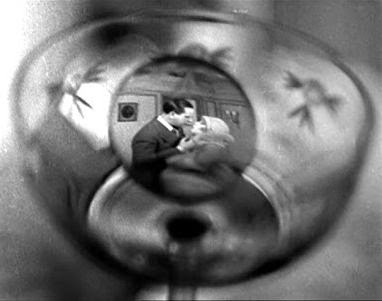 I love it's free association feel and as a film fan, I know for a fact how easy it is to find the smallest things in films to be of influence. Throughout my entire childhood I saw movies (mostly 50s - 60s films) that featured martini's as the drink of choice. What with that classy glass, it always looked so glamorous. When I became of age I ordered one at a restaurant and felt very grown-up, indeed. Imagine my surprise when that cool, clear-looking drink tasted like something to strip paint off furniture. Who knew? And although I can't boast having made any dishes inspired by films I've seen, the one thing I recall and took from that terrible 1996 movie, "Twister", is a taste for steak and eggs. I somehow never had that combination before, and to this day, each time I order that artery-clogging meal, I think of that film. Thanks for a refreshingly unique post! Good to hear from you, Ken, and I'm glad you liked this little experiment of mine. Love your Martini memory. I had a similar experience. Expected something icy and clean and fabulous and nearly choked when I took my first sip of what might as well have been liquid Sterno. I haven't seen "Twister," so don't know anything about the apparently appealing (or at least memorable) role it played. One dish I've always been curious about - but have never made or even tasted - is "timpano," the centerpiece dish in another 1996 movie, "Big Night." That film is a foodie's dream.